Michael received his Bachelors of Science in Chemistry from Pacific University in Forest Grove, OR and his Doctorate of Physical Therapy from Pacific University in Hillsboro, OR. He developed an interest in physical therapy after experiencing how impactful it can be first hand following multiple tennis injuries. 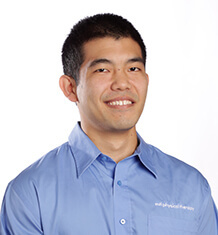 Michael’s background includes experience in outpatient orthopedics with an emphasis in manual therapy. He joined MTI Physical Therapy in the Winter of 2015 and plans to pursue further training through the Ola Grimsby Institute’s manual therapy residency program. Outside of physical therapy he enjoys playing tennis, hiking, running, playing the guitar, and visiting friends and family in Hawaii.